Lightning Breath. The dragon exhales lightning in a 90- foot line that is 5 feet wide. Each creature in that line must make a DC 19 Dexterity saving throw, taking 66 (12d10) lightning damage on a failed save, or half as much damage on a successful one. A bronze dragon lairs in coastal caves. It might salvage a wrecked ship, reconstruct it within the confines of its lair, and use it as a treasure vault or nest for its eggs. The dragon creates fog as though it had cast the fog cloud spell. The fog lasts until initiative count 20 on the next round. A thunderclap originates at a point the dragon can see within 120 feet of it. Each creature within a 20-foot radius centered on that point must make a DC 15 Constitution saving throw or take 5 (1d10) thunder damage and be deafened until the end of its next turn. The region containing a legendary bronze dragon’s lair is warped by the dragon’s magic. Underwater plants within 6 miles of the dragon’s lair take on dazzlingly brilliant hues. 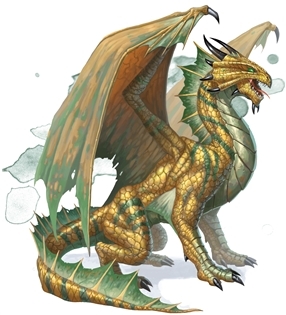 Within its lair, the dragon can set illusory sounds, such as soft music and strange echoes, so that they can be heard in various parts of the lair.